The holidays are here and that last minute shopping is in full gear for many out there. I know that from personal experience, if I have waited until now to do some last minute shopping then it usually means that I have no idea what I am getting the recipient. In this case I have found that finding a gift card for the hard to buy for recipient to be a great way to go every time. Right now I am in that scurry, to find those last minute gifts for those hard to shop for recipients and I will be shopping at Array Gift, where I can purchase a gift card for the my gift recipients then they can get a gift card to the place of their choosing. That way I dont have to figure out where I should get a gift card to. With over 500 retailers to redeem the Array Gift card at, you are sure to get the right present for those difficult recipients on your llist!! I was given a $50 gift code to try out over at Array Gift. It was so easy to redeem. I went on with my gift code, entered the code, picked out the gift card I wanted to use the code on, put in my shipping and in 3-5 days I will have my gift card that I chose! This is the perfect way to get a gift for anyone on your list! 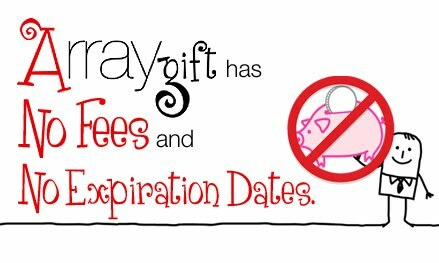 So take the guess work out of gift giving and get the gift that has no expiration date, no extra fees, and no waiting in long lines, shop from your own computer and get those hard to shop for people on your list the perfect gift every time, get them an Array Gift Card today!! Well this holiday season the wonderful people from Array Gift would like to give one of my amazing readers their own $50 Array Gift card to use this season! Head over to Array Gifts and tell me which gift card or cards you would get if you won!! Please leave me your email with this entry!! This giveaway is open to US residents. This giveaway will end at 11:59 pm on January 1,2012. Winner will be chosen at random.org and will be given 48 hours before another winner will be chosen. All products for reviews and giveaways are given as a sample from the companies. All opinions in reviews I conduct are my own. I was not paid to say anything or review any products. Next Post Valentines Day Giveaway Hop! Sign Up Now Open!!! I "liked" your FB page. I like Array on FB…Kimberlie S.T. I like Array Gift on FB…Kimberlie S.T. I like Mommy Katie on FB…Kimberlie S.T. I google+'d this post – Kimberlie T.
I like Katie Sexton on FB…Kimberlie S.T. Networked blogs follower – Kimberlie S.T. I entered your Pepto-Bismol Giveaway. I entered your Swiffer HD Giveaway. I entered your Celebrate with Hershey's Giveaway. I also entered your Hershey's Giveaway! I also entered your Jingle in Your Pocket: GameStop $50 giveaway. I also entered your Chick-fil-A Holiday Giveaway. I also entered your Pepto-Bismol Ultimate Giveaway For The Holidays! I entered your Community Coffee Giveaway. I would love to get a gift card to Lowes — always so many home improvement projects I can do! I'd get an amazon.com gift card! I follow you on Google+. (Corey Olomon)(olomon@hotmail.com)(#3)PS Please delete the 2-3 entries above for the GFC, they were by mistake. How fun! I spent waaay too much time looking at all those gift cards! But I think I would like either Victoria's Secret or Cabelas. I'd get a Kohl's gift card. Barnes and Noble would be my choice! I follow you on GFC user name Lantana H.
I'd get an ACE gift card. DuckySam27@yahoo.comI would love to buy the Amazon gift card.